With the New Year already upon us, have you started your New Year’s resolutions? This year, why not make resolutions that both you and your dog can succeed at! This is not only a great way to bond with your furry friend. Including your loyal companion will help you succeed in all your resolutions for 2019. 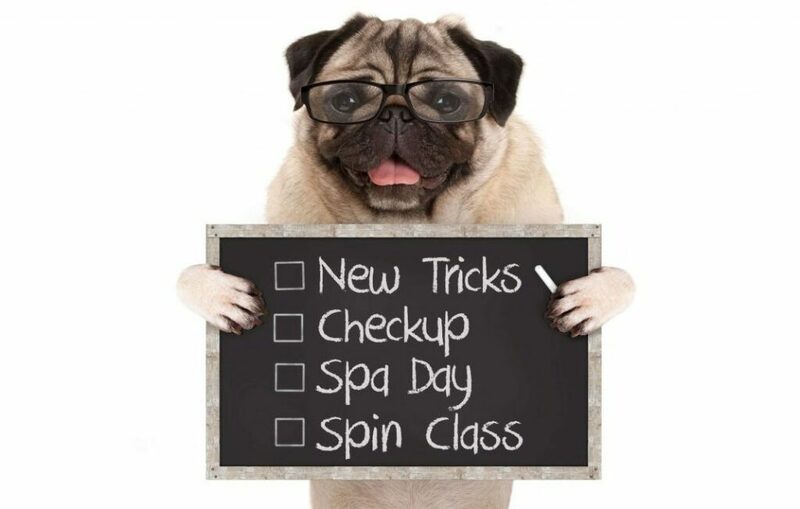 Do you want your pup to learn a few new tricks this year, or need help with behavioral modifications? Paw Commons offer such services as basic obedience training (sit, stay, come, heel) and puppy classes. Need to correct some poor dog behaviors? Our certified trainers also help with barking, counter surfing and countless other tricks. Don’t forget to treat yourself and your pup on a job well done as you both progress in the training. 6 months-1 year vaccines: Lyme, Leptospirosis, K-9 Influenza, and Bordetella. If you are planning to send your pup to doggie day care or boarding, the Bordetella vaccine requires updating every six months. Also, ask the boarding facility or day care if your dog needs the K-9 influenza vaccine. Keeping your dog’s vaccinations current keeps them safe for boarding, grooming, day care. Don’t forget to pamper yourself on a job well done when meeting your New Year’s resolutions. For pet parents, this could mean getting your nails done or a nice massage. For our dogs, this means a full day of fun and pampering. Include a spa session at their next resort playdate. Popular bath add-ons include blueberry facials, hot oil treatments, and teeth brushing. We all want to start the New Year eating healthy and maintaining a healthy weight. Both you and your pet can enjoy this resolution. Ensure your pet is receiving the best food for them in both quality and quantity. Try giving healthy treats such as carrots, green beans or broccoli without any condiments, seasonings or spices. These treats provide greater nutrients and fewer calories. Paw Commons has expanded to include larger retail centers offering a variety of great food and treat options. Check out the latest from Rawz, Fromm, Stella and Chewey’s, and Taste of the Wild. Many of our locations also offer raw food from these brands, raw food toppers and goats milk. For pet parents looking for something to add to their pets diet to help ease anxiety, we have CBD oils and CBD treats available at several of our locations. Start the year out right with naturally calming treats and healthy food for your furry friend. Whether you are trying to lose weight or maintain a healthy weight, this is a great resolution to keep you and your pet healthy. Go enjoy the outdoors, try a new hiking or running path, get out there and have an adventure with your furry companion. If there are certain days where you only have time to go to the gym and not that extra walk with your pup, take them to their favorite doggie day care spot for some day play fun! If you are going on vacation or a work trip soon and your best pal cannot tag along, board them somewhere that offers doggie day care with plenty of play and exercise options.